in the shopping bags industry. 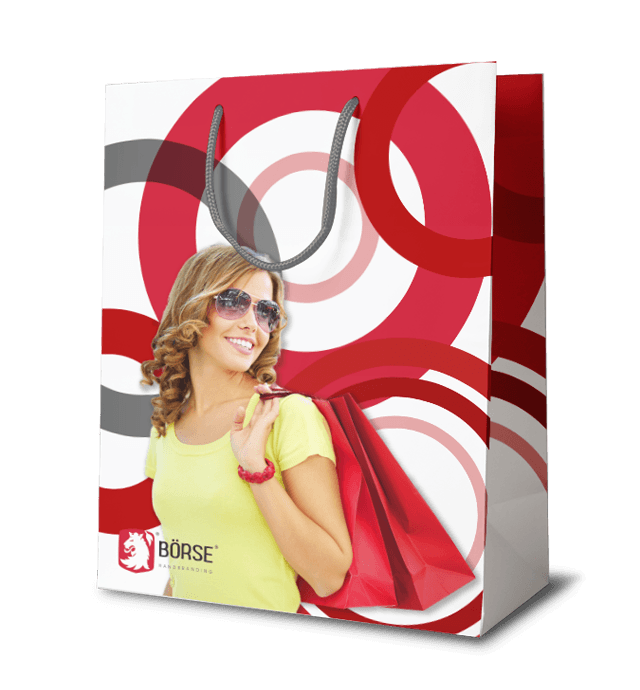 We manufacture and supply shopping bags for commercial and promotional purposes, this custom printed bags are available in various sizes and styles, manufactured in plastic, high quality paper types and fabrics, you can select the material based on your needs and/or according to the specifications on your corporate identity manual. 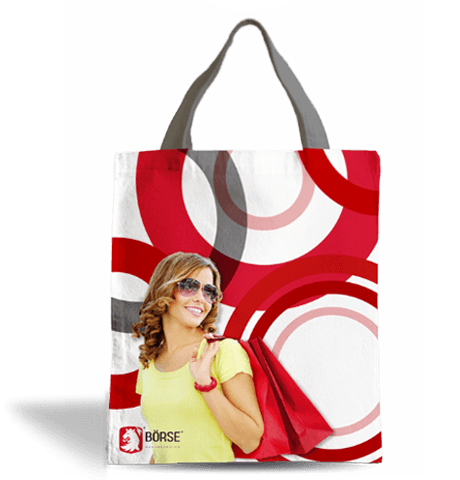 We also offer personalized shopping bags in an extensive range of materials featuring functional and beautyful finishing’s, different types of handles and many other customization and personalization options, providing you with the most attractive shopping bags available on the market. 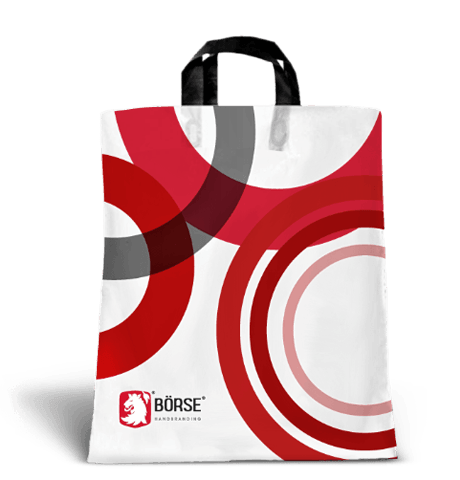 Bags made of plastic and polyethylene, this poly bags are fully customizable according to your logo and branding requirements.. Tailored for retail businesses requiring bags made of the highest quality paper types providing you the best in printing quality..
Reusable fabric bags that are unique in terms of durability, this bags are reusable as they are made of high quality non-woven materials..
A nice looking packaging can make your customers think about your product as a good gift for their loved ones, take a look at at our packaging products. 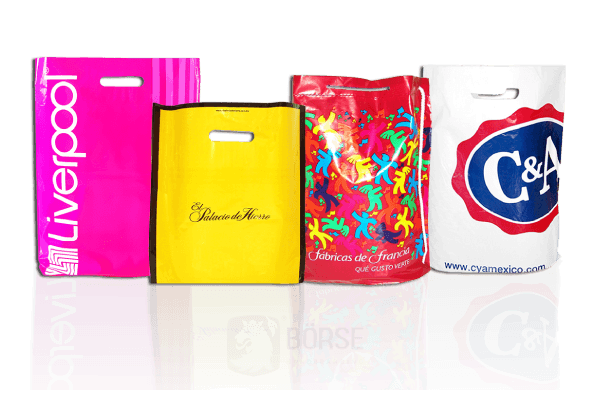 As an internationally recognized shopping bags supplier and thanks to our strategically located manufacturing and distribution facilities, we are able to supply short and high quantities of bags directly to USA, Canada and Latin America; reducing our customer's distribution and logistics costs. 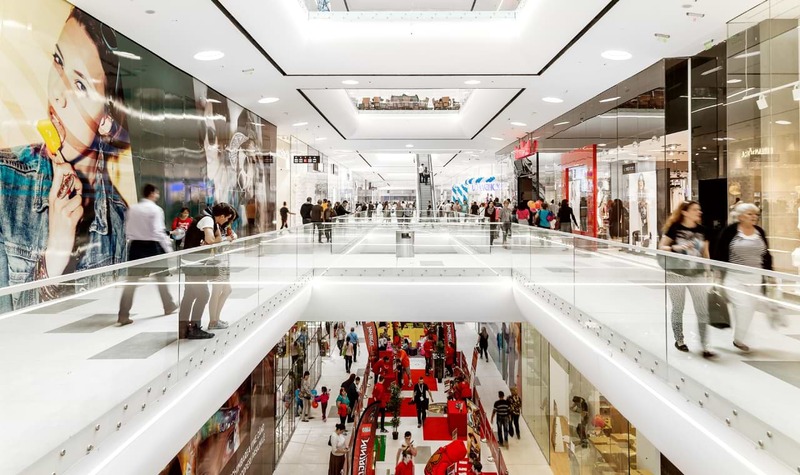 For more than 25 years, we focused on offering the best shopping bags in terms of quality for small business and large clothing brands alike, due to our excellence in customer service and support; today we serve more than 10,000 customers around the world. 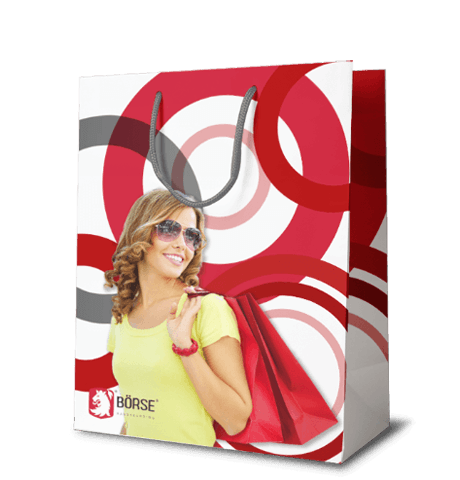 Following up we will present examples of some of our customer’s most requested shopping bags, in order to aid you on identifying the most important characteristics to consider before placing a request for quotation, each example specifies the bag’s material, handle type, printing process, the required inks and finishing’s. The HANDLE TYPE is die cut with (patch) for durability. 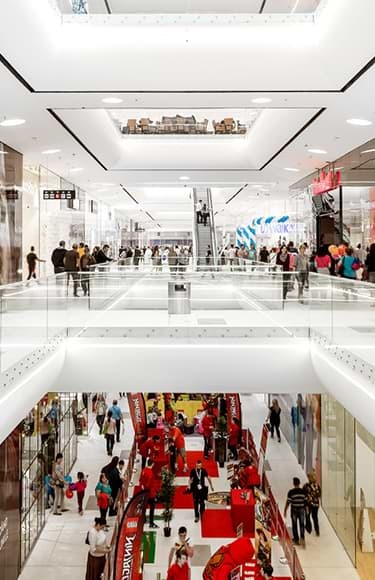 The material is recycled medium density plastic. 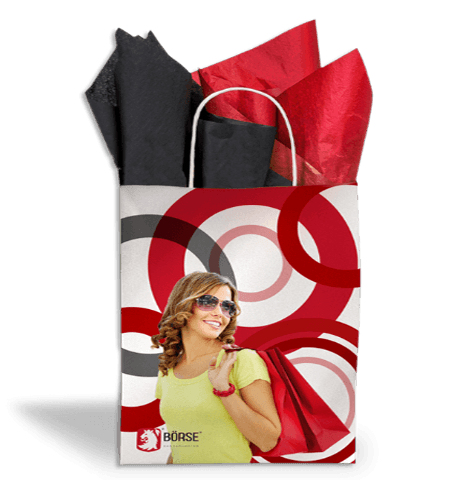 The printing process is flexography with 3 direct soid inks. The handles are made of black plastic. The material is high density plastic partially recycled. The printing process is flexography with 3 direct solic color inks. The HANDLE TYPE in this case is twisted cord. The material is white bond type paper. The printing process is done with 3 direct solid color inks. The handles are made of dark gray cotton cord. The material in this case is couche type coated paper. The printing process is Offset CMYK color. The handles in this case are flexible made of same material. The material is low density plastic partially recycled. The printing process is flexography. 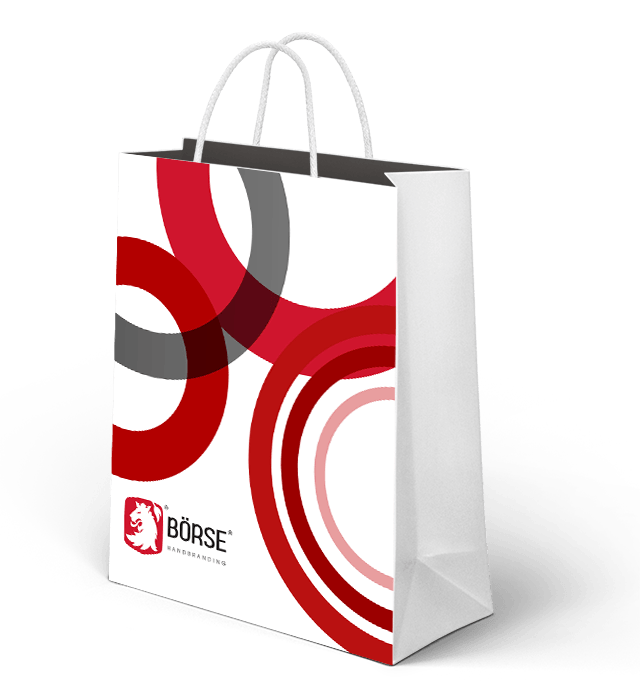 Among our shopping bag clients are companies and businesses of different nature and with different requirements in terms of volumes, their average consumption varies from 5,000 units to several million printed bags per year. 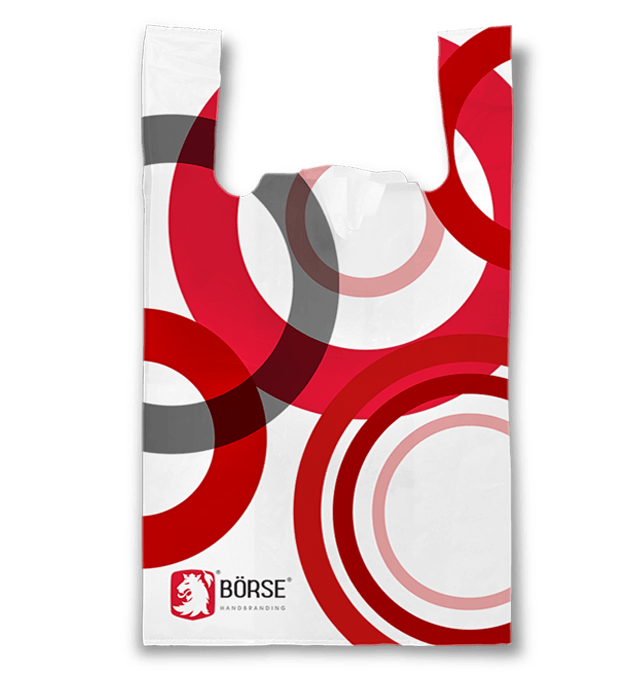 At BÖRSE we reaffirm our commitment to all our customers by offering the best quality in custom printed bags wholesale always with the best cost benefit of the industry, direct from the factory, without intermediaries.